Netflix has shown accelerating positive trends in Japan, according to an RBC Capital Markets Analyst survey. Though Netflix has very shallow penetration in the Asian market, it’s presence will continue to grow thanks largely to the appeal of original content to draw subscribers, Mahaney found. Mahaney raised his price target to $US350 per share. 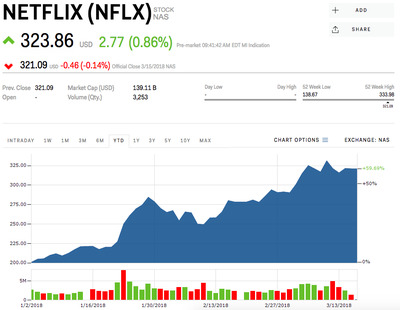 Watch Netflix’s stock move in real time here. The Asian market has been notoriously difficult for Western companies to break into due to the challenges of local rivals, protectionist regulations, and cultural barriers to surmount. But Netflix could find a way in through Japan. Japan is one of the largest markets the video-streaming company has entered, and has been considered “the vanguard of Netflix’s entrance into Asia – a market with not only a large user base but also different cultural dynamics surrounding content streaming,” according to RBC Analyst Mark Mahaney. The Japanese market has been hard for streaming companies to crack into because it is usually ahead of the US in terms of technology, meaning there’s already a plethora of established “freemium” options for consumers to choose from. However, recent trends show that Netflix is gaining some traction in the country, which could set the stage for a deeper penetration into Asia. Though only 5% of respondents to an RBC survey said they watched Netflix – up from 3% in February 2017 – 63% of Japanese subscribers said they were “Extremely” or “Very” satisfied with Netflix, and a record-high 31% of Japanese subscribers said they were “Extremely,” “Very,” or “Moderately” likely to pay for the streaming service, compared with 24% in the same month a year ago. “We believe that these results highlight that Netflix’s entry into Japan is still early, but materially improving,” Mahaney said. Mahaney also looked at GoogleTrends data across the continent and found there were “consistent upward trends” in search results for “Netflix” in 2017 and into 2018. There have been studies that found a correlation between Google searches of the term “Netflix” and Netflix viewership numbers. “2017 appears to have been an early pivot year for Netflix in Asia and 2018 is showing good momentum so far,” Mahaney wrote in a note. There is also an opportunity to appeal to this large segment of the global population through its slate of new and original content planned for this year, Mahaney says. Around 88% of Japanese respondents indicated that original content influenced their decision to use the service. “We believe these [numbers] indicate the broad appeal of Netflix’s Original Content slate, not only across geographies but even across languages barriers,” Mahaney added. Mahaney raised his price target to $US350 from $US300. Netflix’s stock was trading at $US323.86 per share, and was up 59.69% for the year. Read more about why Netflix’s biggest advantage is its brand.